Everything is OK here at the Kinsale Yacht Club. I meet a lot of interesting sailors and everyone is kind to me. Now with a fairly long ocean passage down to Porto Santo in the Madeira island group in front of me I indulge in icecreams now and then I also buy books. The weather out in the Bay of Biscay is not at its best but in a weeks time or so it seams to improve, but it is a long shot. 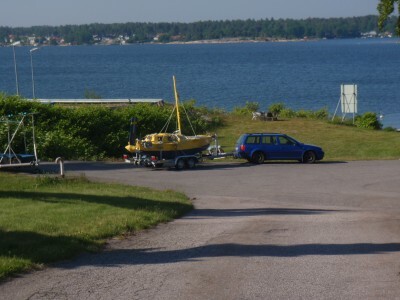 Jonas Åkerblom has succesfully delivered my car and trailer to Hunnebostrand in Sweden where it is now waiting for my return which might be arund Christmas. Tomorrow night at about 7.30 I will give an illustrated talk in Cronins Bar Crosshaven for details call Tom Harding 087 9858029 everyone is welcome. Hopefully the weather will improve. 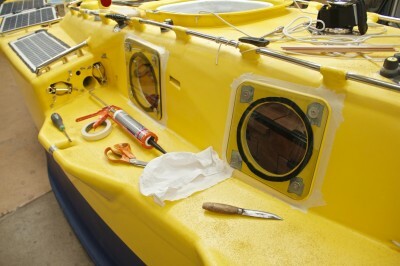 To day I have bottom painted my boat and put her in the water. George from Kinsale boatyard kindly towed me to the marina at Kinsale Yacht Club where the boat now occupy a nice spot. Everyone here is very kind and helpful and everything is fine. I will now sort things out, rest and plan my next move. This morning I finally reached Kinsale and the boatyard where I am going to launch the boat. I am at the moment sitting in the Kinsale Yacht Clubs club room. It has been a tiring drive but very interesting. Like at sea I use no radio for entertaining but listen to my inner voice. I have crossed four major water barriers whith my car and trailer. First on the new long bridge from Sweden to Dennmark. Then on a ferry from Denmark to Germany. Luckily I passed Hamburg and Bremen late at night. The next day I came to Calais in time for an afternoon ferry. The ferry company told me that if I waited to past midninght the price would be less than half and even that was not cheap. Therefore a few hoers waiting saved me a lot of money. I drove past London during the night avoiding a lot of traffic. Next day I had missed the Fishguard Rosslaire ferry to Ireland by five minutes. Next one was 2 30 in the morning so not much sleep this night either. Luckily I found my way without to much trouble to Kinsale Boatyard. George, the boss promised to help me and gave me a good price. At the boat yard I will bottom paint her and put up the masts. I also met some nice people on an old Colin Archer who told me the could help me to bring the boat to the boat club marina. Now I am very tired and it is a long walk to the boatyard therefore this is all for today. I have now reached Fishgard in Wales and I am waiting for the ferry to Rosslare Ireland to depart. It will do so 2 45 in the morning. Missed the previus one by five minutes, so a tvelve houer wait. The positive is that I have been able to drive relaxed not worrying abut time. 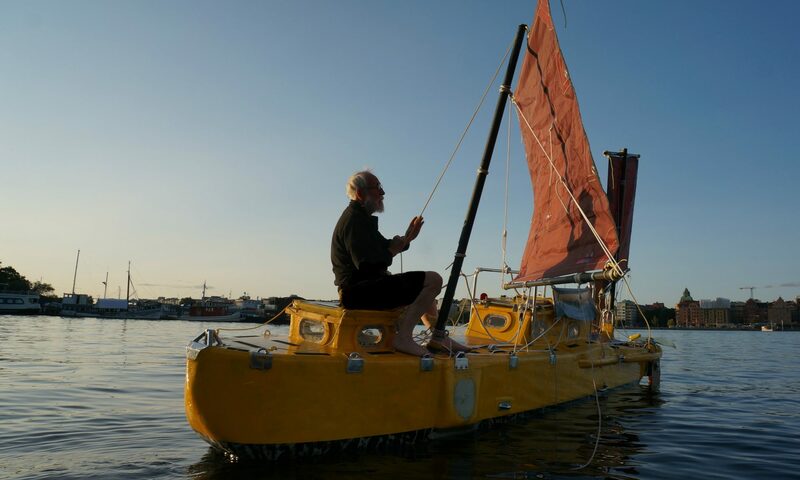 Last night in Calais I met a catamaran sailor he told me he was going to Cornwall wich was about the same way. By luck I saw him at unloading and followed hin thruogh the London night. He was a good guide. and six a clock in the morning I could lay my head to sleep after driving from just west of Bremen for close to 23 houers. I have now past all the big citys in the night with little trafic. The specially made TK-trailer has behaved excellent. I hope to bee soon in Kinsale there I will launch the boat. 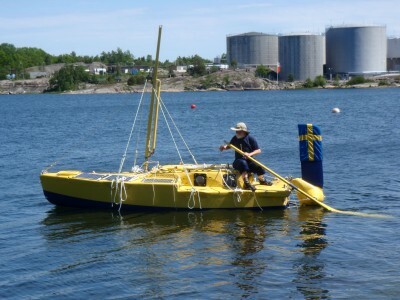 Jonas Akerblom a freind who has with his wife crossed the Atlantic in a boat of my design will drive car an TK-trailer back home. I plan to leave Västervik tomorrow monday 25 of July after breakfast. 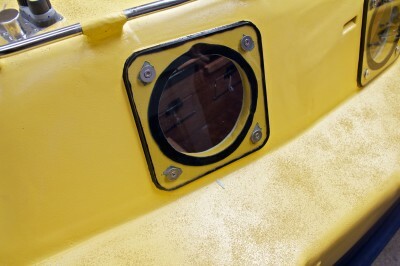 I hope to leave my home port trailing the boat behind my car, beginning of next week. The planned route is thrugh Denmark Germany Belgium France England Wales Ireland. The destination is Kinsale Ireland. There the boat will be launched. A freind will come by airplane and drive the car and trailer back to Sweden. The boat has now been sailed inshore and evaluated. Everything did not come up to my expectations, but I feel that I am on the right track. There are problems with qualities and quantities. I will give up the idea of tilting the masts. Instead I will use two unstayd masts. I will give up the central hatch. Instead I will use two hatches one at each mast. The difficult thing is to keep the good qualities when changing the design. 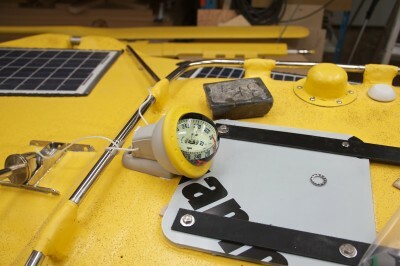 The present boat is very easy to handle and propel with the yoluh. If I give her to much beam and make her to big I will loose those qualitys. 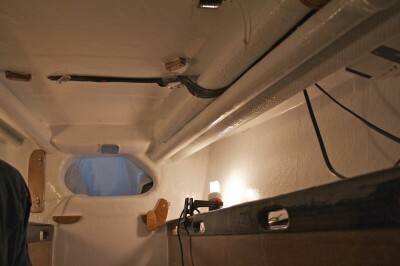 To give a boat without a ballastkeel positive rightning arm at all angels of heel, height to beam should be in the region of 1 to 1,25. My and Matts boat have those proportions. 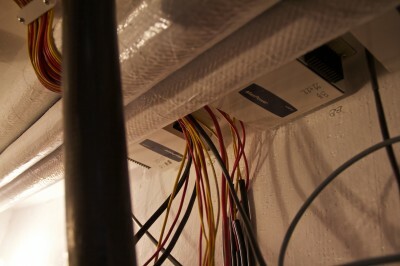 Therefore by squaring beam times lenght I can get a certain measure of size for comparison. 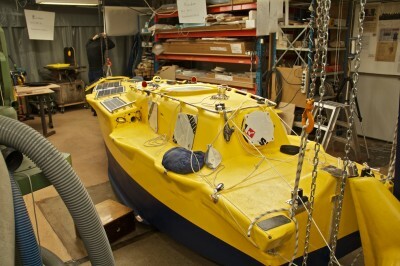 The next boat will therefore bee smaller than Bris and Amfibie-Bris but bigger than Paradox and Yrvind.com. My sailing experience with the above boats makes me think that the new boat also will be easy to handle and propel with the yoluh. As I have only tryed the present boat inshore a few houers and offshore not at all. I am likely to get new ideas with more experience. I like the 25 centimeter draft. I like that I can dip my hand in the water without bending over to much. 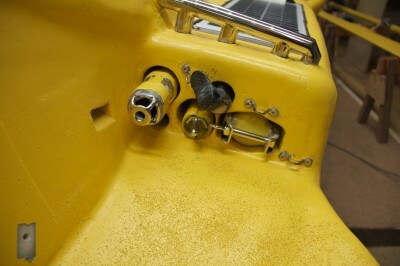 The sprit is supported by the gooseneck toggle. It is a succes. 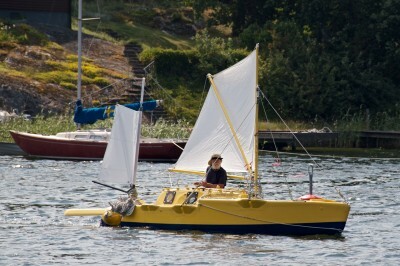 The wingmast works very well in conjunction with the sprit. 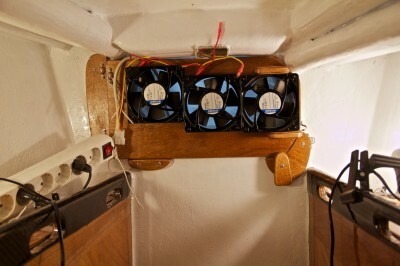 And finally she is a very symphatic boat, very strongly built with good materials. But, Cape Horn have to wait for the next boat. 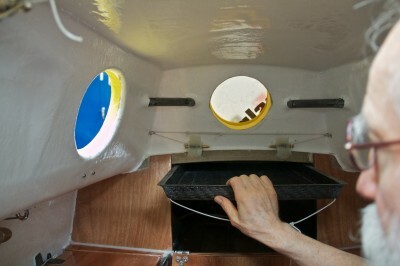 Now I will sail to Florida and consult Matt about my new project. 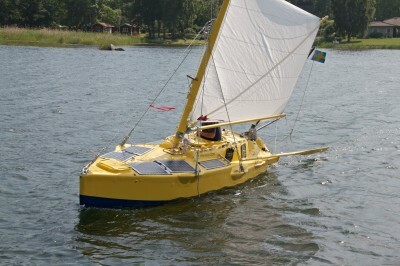 Yrvind implements test sailings in Stockholm archipelago. More coming soon. 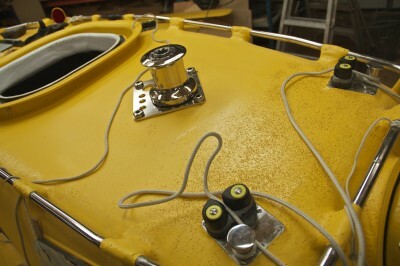 The boat is now launched. The sculling oar is working but it will take a while before i sail her. She is sympathetic. More later. 22:nd of april is Yrvinds birthday. 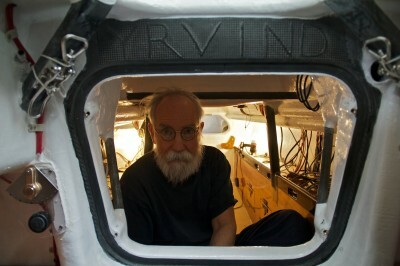 That fact gave me a reason to visit him in Västervik and to see how his project advanced. This winter I have talked to him a lot on Skype and he had given me vivid reports about the project. So, I thought I was prepared of what was waiting. 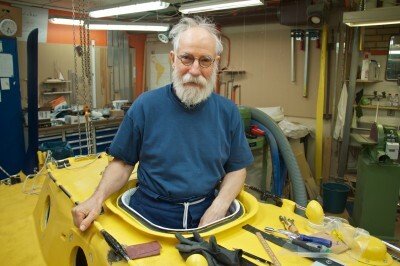 But in place in his workshop I became surprised. 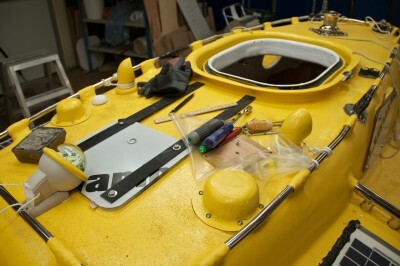 What I saw gave me a Wow feeling – this yellow creation is something special. 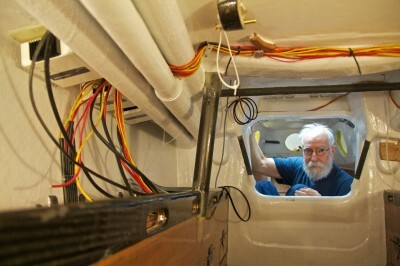 I had plenty of time to study the boat since the workshop would be the place where I should sleep over the night. In my bed on the floor I was studying hers shapes and many thoughts passes through my head. That she i extremely strong is for sure, no doubt about it. But how would she perform under sails. 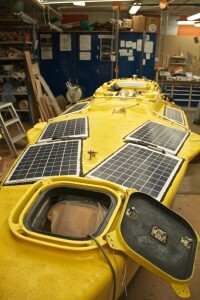 The boat weight fully loaded, is about 1.2 ton and she is only 4. 8 meters long and 1,3 meters wide. 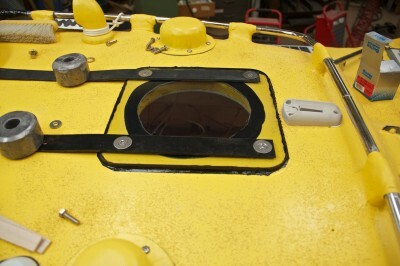 She have no keel, just chinerunners attached alongside the hull. 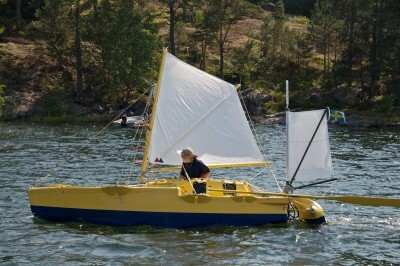 Will this concept work on a small boat with a heavy displacement and relatively small sails? 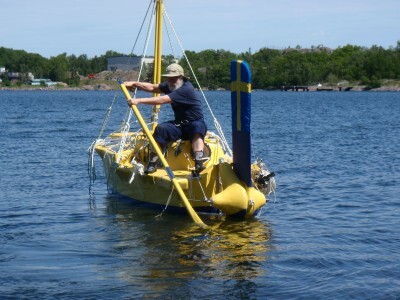 Will his ideas about self steering be functional on a boat with this kind of “tiller” construction? 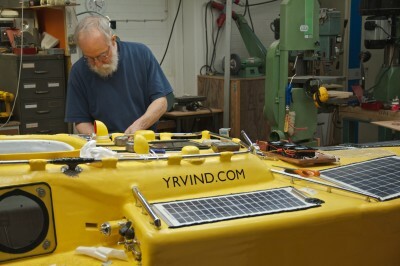 Anyway, it will be very exiting to follow Yrvind when he launch the boat and start testing her. Hopefully this will happen very soon.